A collaboration between scholars at the University of Bristol, University of Lincoln, the Institut d'Asie Orientale, and the TGE-Adonis, this project aims to locate, archive, and disseminate photographs from the substantial holdings of images of modern China held mostly in private hands overseas. 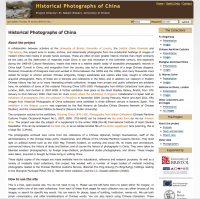 These are often of even greater historic interest than might ordinarily be the case, as the destruction of materials inside China in war and revolution in the twentieth century, and especially during the 1966-69 Cultural Revolution, means that there is a relative dearth today of accessible photographic records in China itself. Turmoil in China, and emigration from the country, also led to the development of a large Chinese diaspora. Moreover, thousands of foreigners lived and worked in China between the 1840s and the 1950s, and many thousands more visited for longer or shorter periods. Chinese emigrants, foreign expatriates and visitors alike took, bought or otherwise acquired photographs. Many of these are in libraries and collections in the West, and in addition our research in modern Chinese history has led us to many interesting private collections. Images from private and public collections are available here. An exhibition of this material took place in London, Bath, and Durham in 2007-2008. A further exhibition took place at the Grant Bradley Gallery, Bristol, from 17th January to 21st February 2009. For more details click here. Collaborators in Spain are holding an exhibition of photographs from the collection in Pamplona which opened in November 2009. This link also leads to an order form for the companion volume to the exhibition, Picturing China 1870-1959: Photographs from British Collections (Chinese Maritime Customs Project Occasional Papers No.1, 2007, ISSN: 1755-6643). The project was also the subject of a supplement to the winter 2008 (No.46) International Institute of Asian Studies Newsletter. This can be accessed at the IIAS site, or as an Adobe Acrobat file of the entire supplement here (warning, this is a large file, 3.24mb). The photographs archived here come from the collections of a Chinese diplomat, foreign businessmen, staff of the administrations in the Chinese treaty ports, missionaries, and officials of the Chinese Maritime Customs Service. They shed light on political events such as the 1925 May Thirtieth incident, on working and social life, on treaty port architecture, commercial history, the history of dress and fashion, and of course the history of photography in China. They were taken by talented amateur photographers, by foreign snap-shotters, professional studio photographers, and others. These images were taken, acquired or bought by those living or visiting China. These digital copies of the images are made available here for educational, reference and research purposes. As well as a variety of modestly sized collections, this project has worked with a number of larger bodies of material including photographs related to the Chinese Maritime Customs Service, diplomat Foo Ping-sheung (Fu Bingchang), holdings relating to the Shanghai Municipal Police, the G. Warren Swire collection, and the J.C. Oswald collection (SOAS).